The 2018 ESSENCE Festival announces its all-star, night-by-night performance schedule for the Festival’s concert series, taking place from July 6 to July 8 at the Superdome in New Orleans, LA. 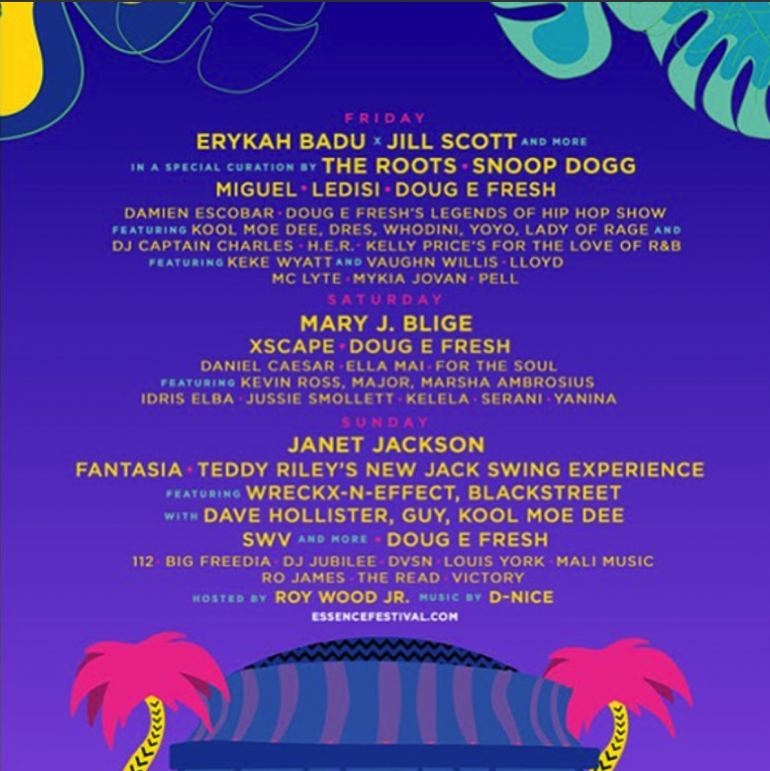 Janet Jackson, Mary J. Blige, Erykah Badu and Jill Scott headlining with special guests Snoop Dogg, 112; Daniel Caesar; D-Nice; Doug E. Fresh’s Legends of Hip-Hop Show featuring Big Daddy Kane, Kool Moe Dee and more; DVSN; Fantasia; H.E.R. ; Idris Elba; Kelela; Kelly Price’s For The Love of R&B featuring Dave Hollister and Vaughn Willis; Kevin Ross; MAJOR. ; Mali Music; Marsha Ambrosius; MC Lyte; Miguel; Mykia Jovan; Ro James; Teddy Riley’s New Jack Swing Experience featuring Wreckx-n-Effect, Blackstreet and Guy. Roy Wood Jr., from Comedy Central’s “The Daily Show,” will return as the Mainstage host, with more surprise guest performances to be announced. The legendary D-Nice will also keep the Mainstage music going for the weekend. The Read’s Kid Fury and Crissle; VICTORY, Xscape and many more to be announced soon. Mainstage host: Roy Wood, Jr.